Spellbound. My husband Larry and I sat next to each other hardly able to breathe. This choral production on stage reached back across the decades of our lives. With tears streaming down our cheeks, we solemnly acknowledged that the choir’s singing was not a random performance. We felt as though we were standing on holy ground. On a blistering hot, sweltering, humid day in the Deep South, Larry moved from one day lily flower bed to another. His job assignment on the grounds crew at Mississippi State University focused on landscaping—aka pulling weeds. As a young believer, 3 years old in The Lord, he used the mindless job to engage his thinking in Scripture meditation and prayer. And he had much to pray about! With our wedding a brief two weeks away, and the excitement escalating with the passing of each day, he certainly needed to pray. The Spirit of God invaded his thoughts and forever changed the course of his life and ours. Unannounced and unsolicited, God poured into my future husband’s mind a vision depicting the countries currently trapped behind the Iron Curtain becoming inflamed with the Gospel. At this time in 1973, the countries of Eastern Europe (the Warsaw Pact) and the Soviet Union were gripped in the iron fist control of a totalitarian, atheistic government where missionary activity was forbidden. The law was enforced with a vengeance, and refusal to obey resulted in grave consequences. Into this chilling political reality, God burdened Larry with a vision contrary to current events. For an entire week these thoughts dominated his mind with Technicolor vividness. His youthful faith had never experienced such a dramatic, supernatural encounter with The God of Heaven. Particular to Larry's vision was seeing and hearing a choir in The Soviet Union singing the Hallelujah Chorus. Yet how could this ever come to pass? The mind-boggling dynamics eluded us for years. However, this vision and its direct connection to The Great Commission of Matthew 28:18-20 were destined to direct our lives. Without knowing about the 1973 vision, the international leadership of our movement asked us in 1977 to go and live covertly behind The Iron Curtain. We humbly accepted this opportunity, and walked away from all that we held dear to obediently pursue God’s crystal clear call on our lives. Only God deserves credit for the supernatural events that unfolded. Living and working among the people enslaved by Communism, seeing those people become politically free, witnessing the rapid expansion of the Gospel are gripping experiences which defy description. After 1989 and the historic Fall of The Wall, political freedom brought opportunity as never before to reach people for Christ. Using the JESUS film, city campaigns occurred across twenty nations, and 150 million people (previously denied the opportunity) heard the glorious Gospel. One such sweeping campaign transpired in 2007 in the Siberian city of Krasnoyarsk with its population of 1,035,528. The opening night of the campaign, church and government officials gathered in the monstrous cultural center for an unprecedented ceremony. In a first ever gathering of its kind, the Siberian city sat poised for the premier of the JESUS film for its population. Introductions, ribbon cutting, speeches, gifts, and acknowledgements all filled the evening program. And then the choir stood to sing. The organist gave the introductory strains, the director raised her hands, and the eyes of each former-citizen-of-the-Soviet-Union choir member focused on her. But for Larry and me, the eyes of our hearts could only focus on heaven. 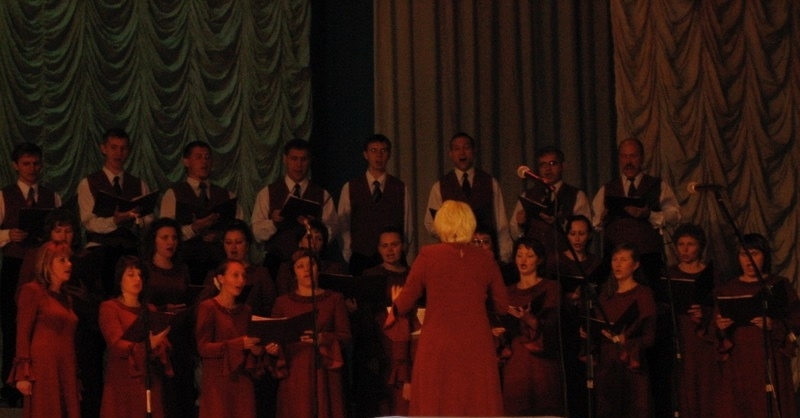 The choral selection this frigid night in Siberia was the—Hallelujah Chorus. Spellbound, Larry and I sat next to each other hardly able to breathe. This choral production on stage reached back across the decades of our lives. With tears streaming down our cheeks, we solemnly acknowledged that the choir’s singing was not a random performance. We felt as though we were standing on holy ground. Thank You, God, for connecting 1973 with 2007—Mississippi day lilies and Siberian singers. Thank You for pulling back the curtain to allow us to witness what prophets of old longed to see. Thank You for entrusting us with a vision and for the joy of seeing it come to pass. Thank You that Your Gospel is in fact, finally able to go to Eastern Europe and the former Soviet Union, to those who have never heard. Living with Eternal Intentionality: “Things which eye has not seen and ear has not heard, and which have not entered the heart of man, all that God has prepared for those who love Him” (1 Corinthians 2:9 NASB).